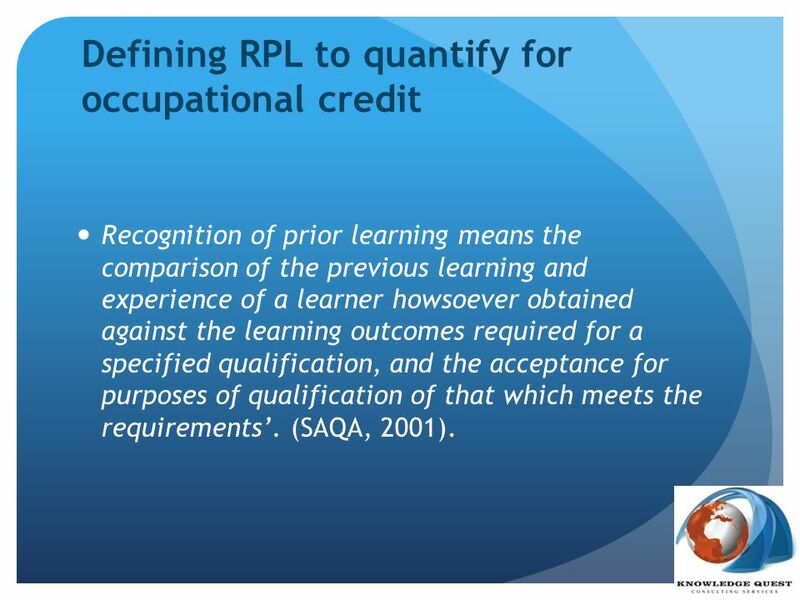 Recognition of prior learning means the comparison of the previous learning and experience of a learner howsoever obtained against the learning outcomes required for a specified qualification, and the acceptance for purposes of qualification of that which meets the requirements’. 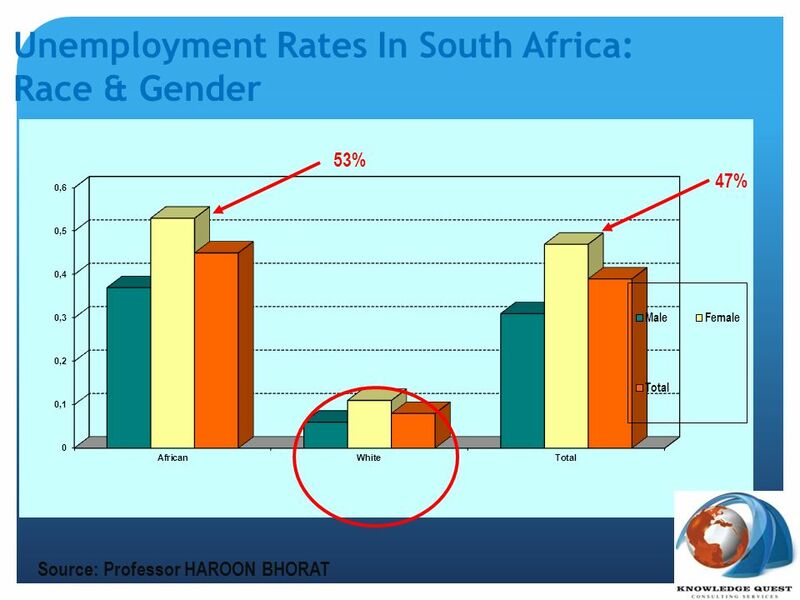 (SAQA, 2001). 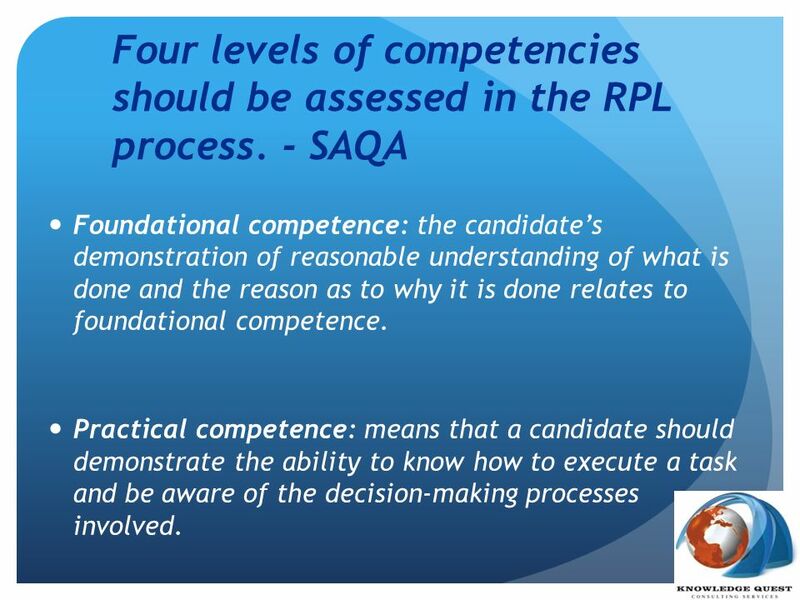 Four levels of competencies should be assessed in the RPL process. 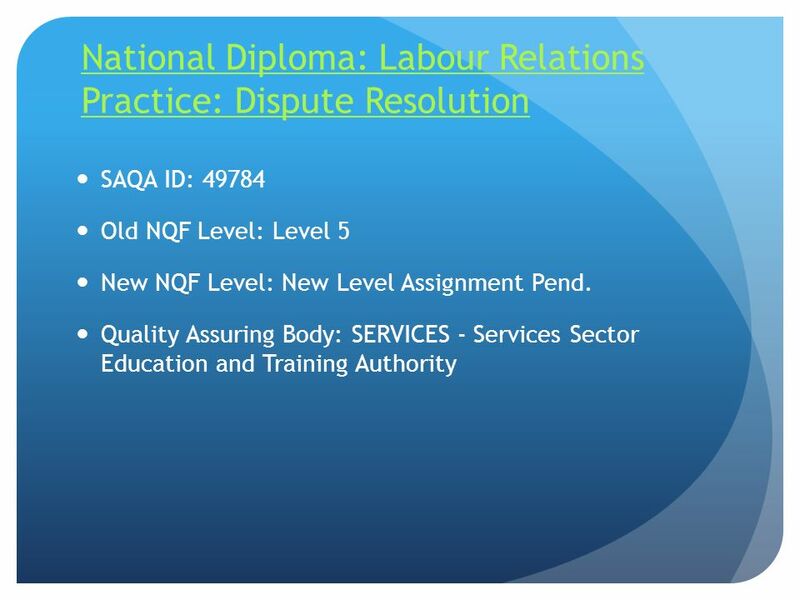 - SAQA Foundational competence: the candidate’s demonstration of reasonable understanding of what is done and the reason as to why it is done relates to foundational competence. Practical competence: means that a candidate should demonstrate the ability to know how to execute a task and be aware of the decision-making processes involved. 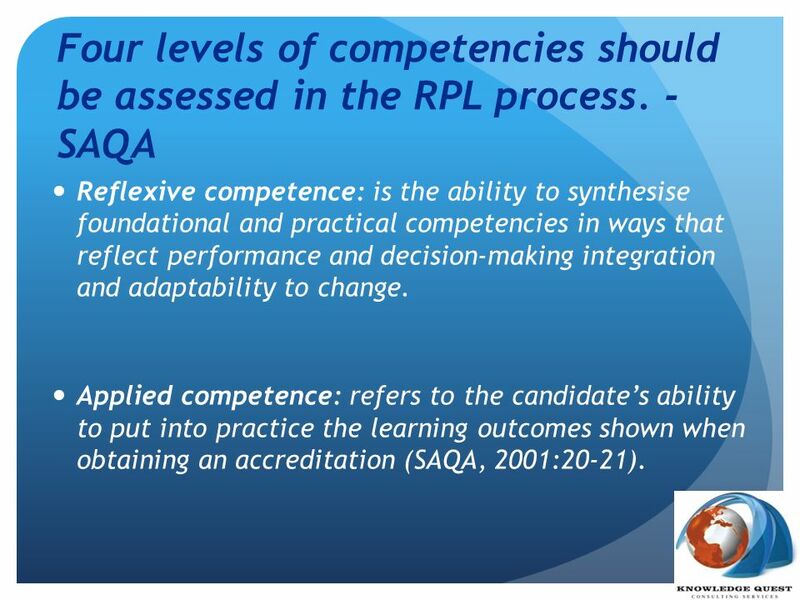 Four levels of competencies should be assessed in the RPL process. 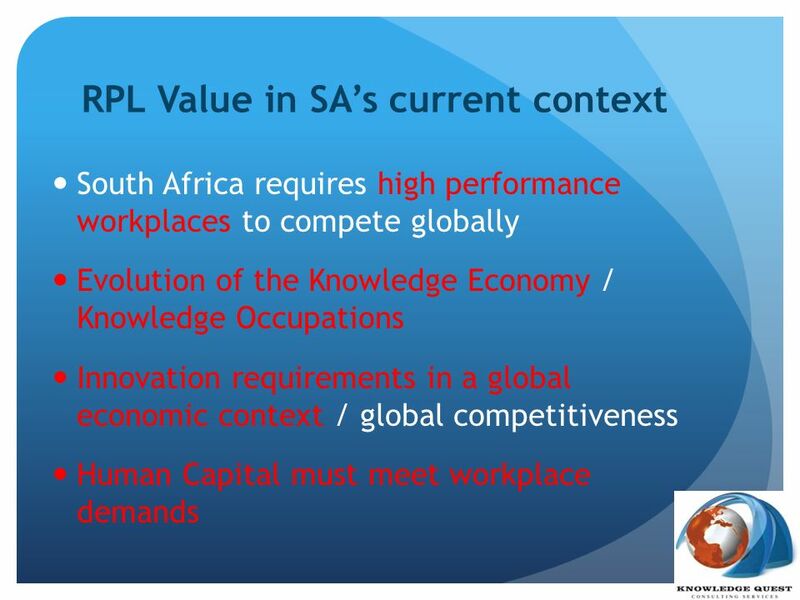 - SAQA Reflexive competence: is the ability to synthesise foundational and practical competencies in ways that reflect performance and decision-making integration and adaptability to change. 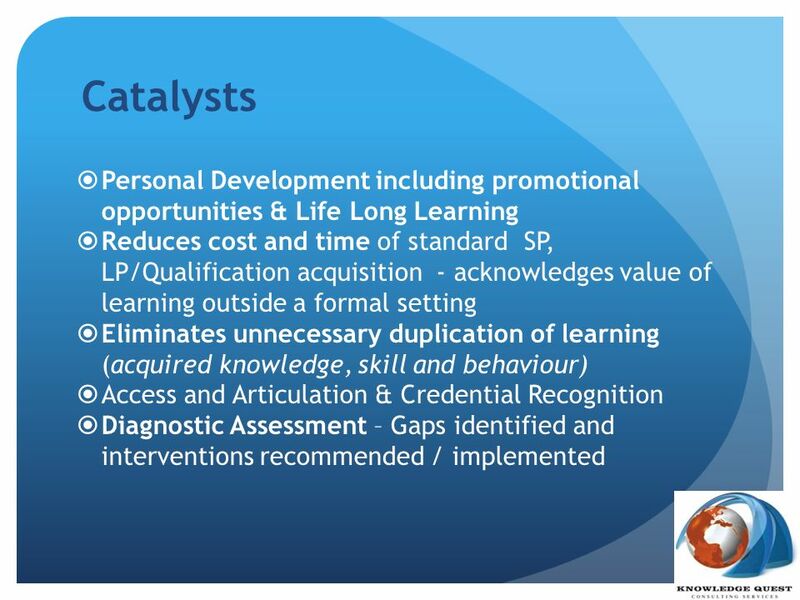 Applied competence: refers to the candidate’s ability to put into practice the learning outcomes shown when obtaining an accreditation (SAQA, 2001:20-21). 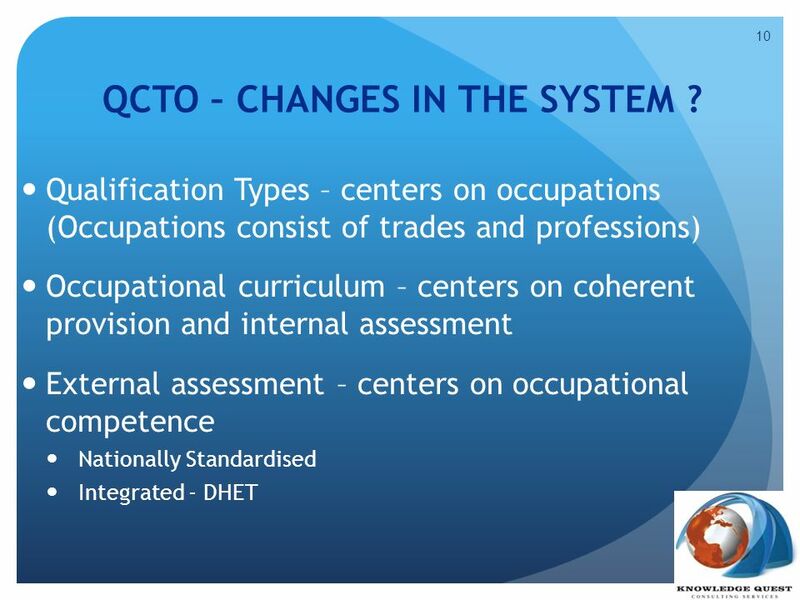 10 QCTO – CHANGES IN THE SYSTEM ? 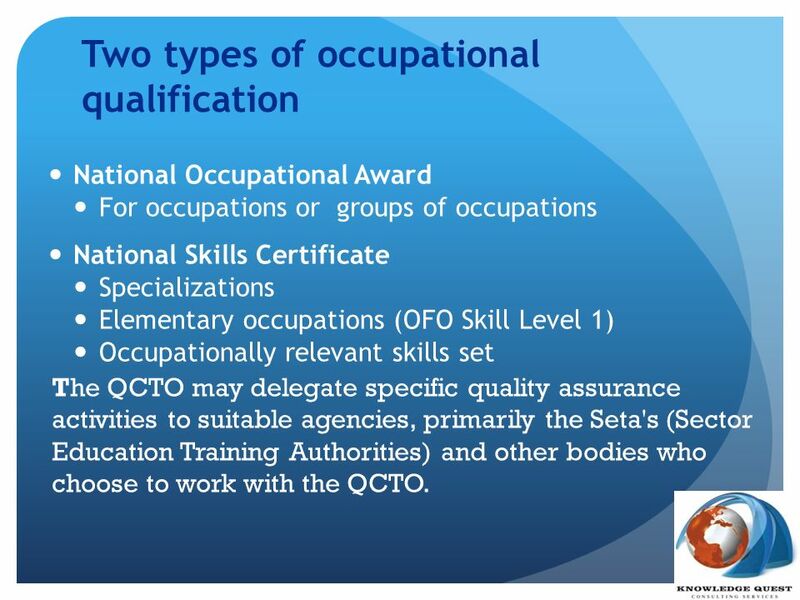 National Occupational Award For occupations or groups of occupations National Skills Certificate Specializations Elementary occupations (OFO Skill Level 1) Occupationally relevant skills set The QCTO may delegate specific quality assurance activities to suitable agencies, primarily the Seta's (Sector Education Training Authorities) and other bodies who choose to work with the QCTO. It is important to note that a ‘job’ and ‘occupation’ are not the same. 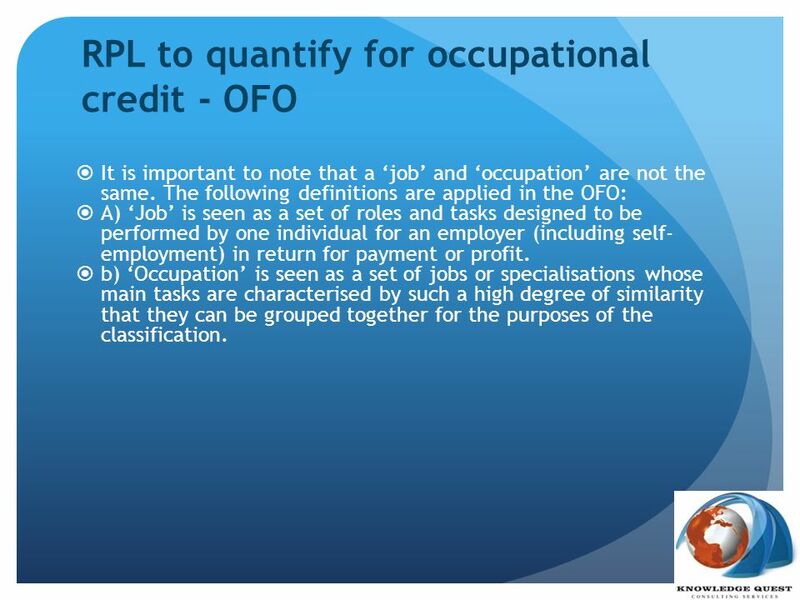 The following definitions are applied in the OFO: A) ‘Job’ is seen as a set of roles and tasks designed to be performed by one individual for an employer (including self-employment) in return for payment or profit. 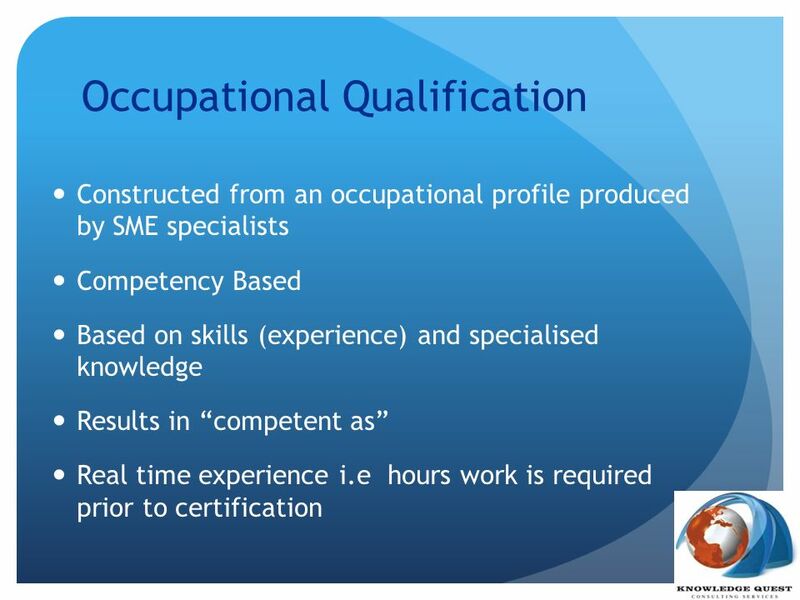 b) ‘Occupation’ is seen as a set of jobs or specialisations whose main tasks are characterised by such a high degree of similarity that they can be grouped together for the purposes of the classification. 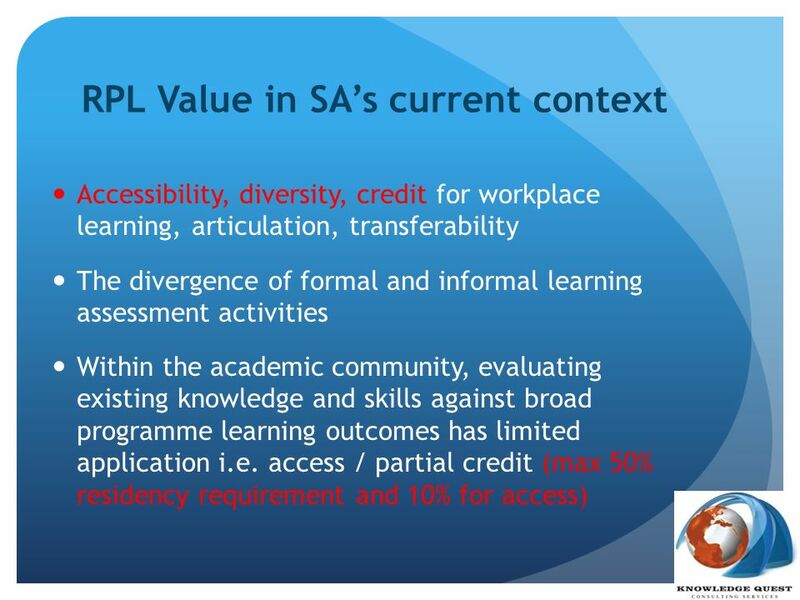 Accessibility, diversity, credit for workplace learning, articulation, transferability The divergence of formal and informal learning assessment activities Within the academic community, evaluating existing knowledge and skills against broad programme learning outcomes has limited application i.e. access / partial credit (max 50% residency requirement and 10% for access) The HEQCs position is for its constituents to use RPL for purposes of access only, i.e. 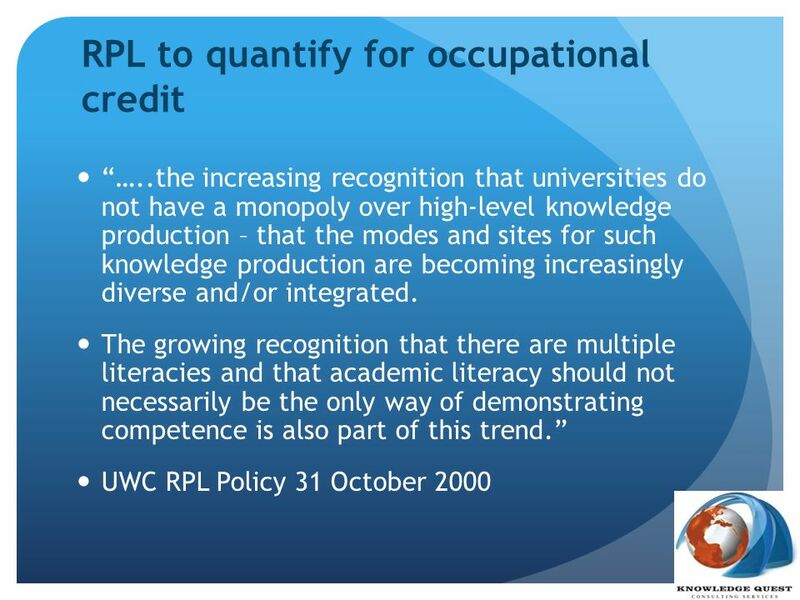 ease of entry into higher education learning as recommended by Castle and Attwood (2001) in their article entitled: “RPL for access or credit: problematic issues”. 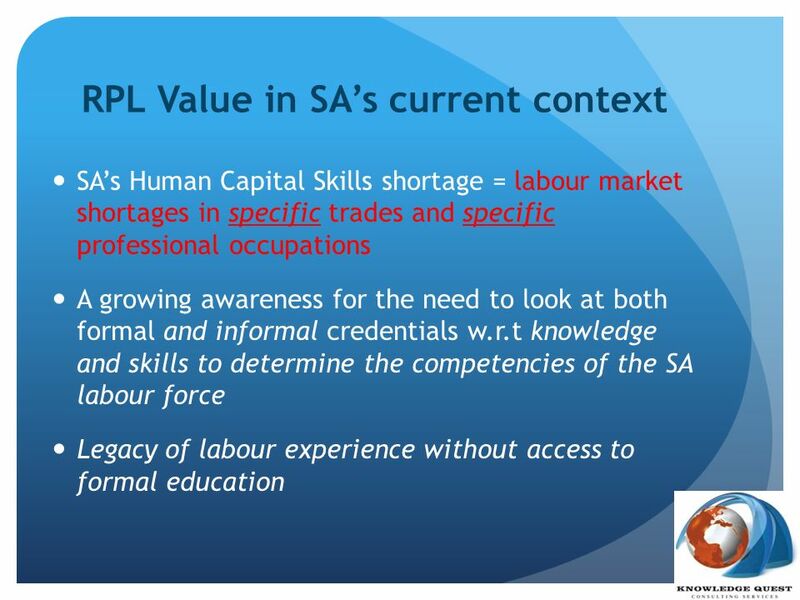 SA’s Human Capital Skills shortage = labour market shortages in specific trades and specific professional occupations A growing awareness for the need to look at both formal and informal credentials w.r.t knowledge and skills to determine the competencies of the SA labour force Legacy of labour experience without access to formal education Paul Bouchard in his article entitled, Training and Work: Myths about Human Capital, argues there are no skill shortages, rather there is a skill mismatch (Bouchard, P, 1998) RPL was conceptualised by the South African government as a key strategy for achieving the objectives of the NQF, which are access and redress. 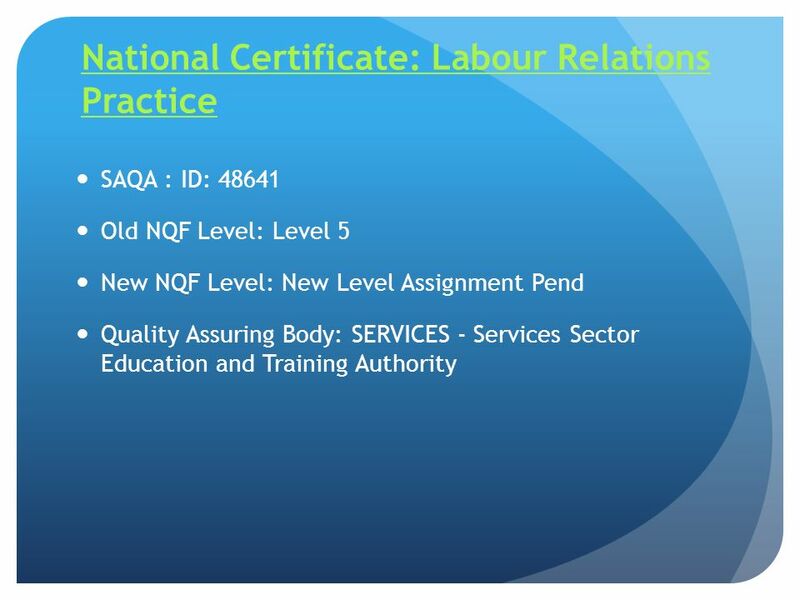 RPL is a statutory obligation, promulgated by these acts: The South African Qualifications Authority (SAQA3) Act (Act 58 of 1995); The Employment Equity Act (Act 55 of 1998); and The Skills Development Act (Act 97 of 1998). Legislative / Regulatory Framework Transferability in FET/HET Academic Environment Barriers to entry / access to RPL Over complex process / cumbersome / misunderstood Incorrect candidates being presented Workplace Un-responsiveness & unwillingness to accept RPL Often assessment processes/ procedures are elaborate, costly and highly bureaucratized, placing little or no value on work experience gained outside Canada (Reitz, 2001). 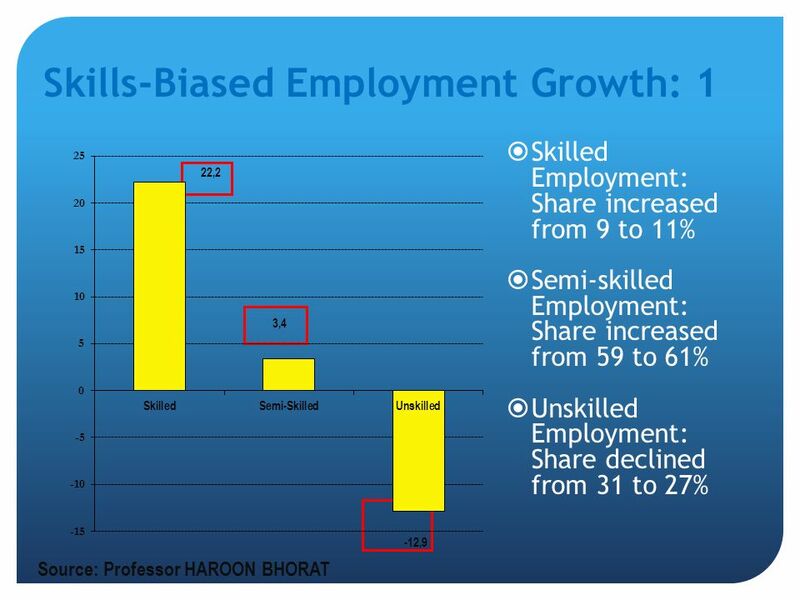 Succession Planning, Career Planning and Development Promotional opportunities - socio-economic status improved Social justice & Transformation – unemployed and academically deprived individuals are afforded opportunities to codify knowledge and experience Validates learning gained through work and life experience Learners to make judgments concerning their own knowledge and skills At country level, Harris and Saddington (1995:7) state that in terms of the current political, economic and social context in the country, RPL has the capacity to “contribute to redress and equity by opening up more ways for people to attain qualified status (qualifications); enable more people to reach higher levels of qualification and expertise by beginning with an acknowledgement of existing skills and knowledge; contribute to enhancing international economic competitiveness by building on often invisible and unacknowledged workplace skills; and offer the first step in attaining the goal of developing a multi-skilled and flexible workforce by acting as an auditing tool to qualify existing competence”. 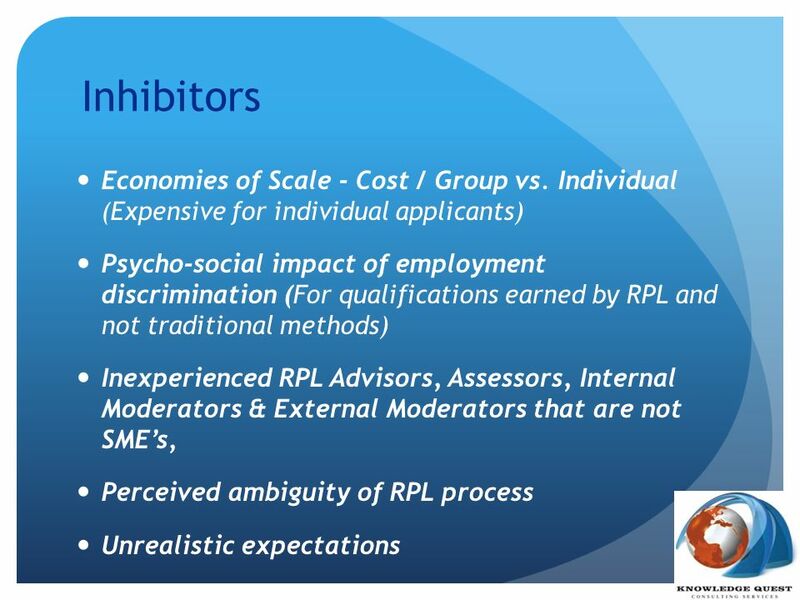 Download ppt "Opportunities and changes in Workplace RPL"
Page 1 IMPLEMENTING THE MALTA QUALIFICATIONS FRAMEWORK FOR LIFELONG LEARNING THE KEY CHALLENGES TIPTOE Conference: Working on EQF – From Framework to Practice. 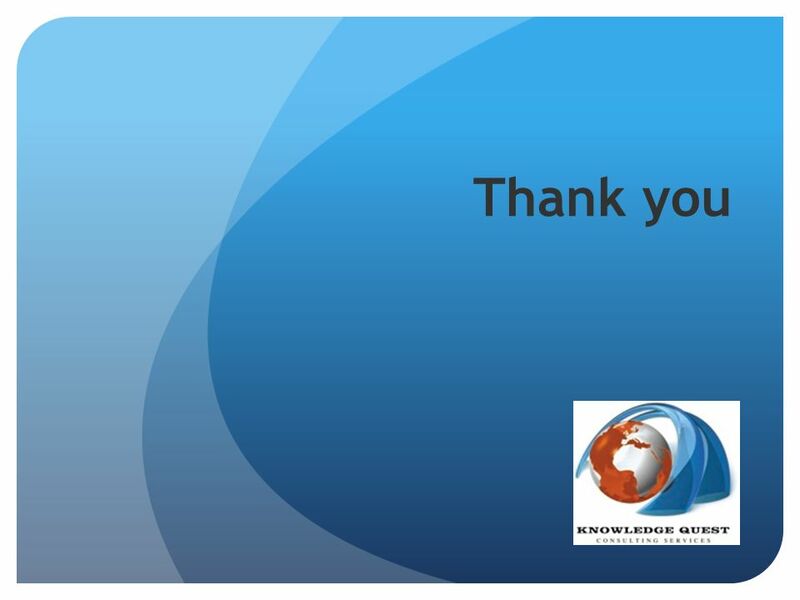 Prior Learning Assessment and Recognition (PLAR) CANADA Canadian Information Centre for International Credentials (CICIC) at the Council of Ministers of. 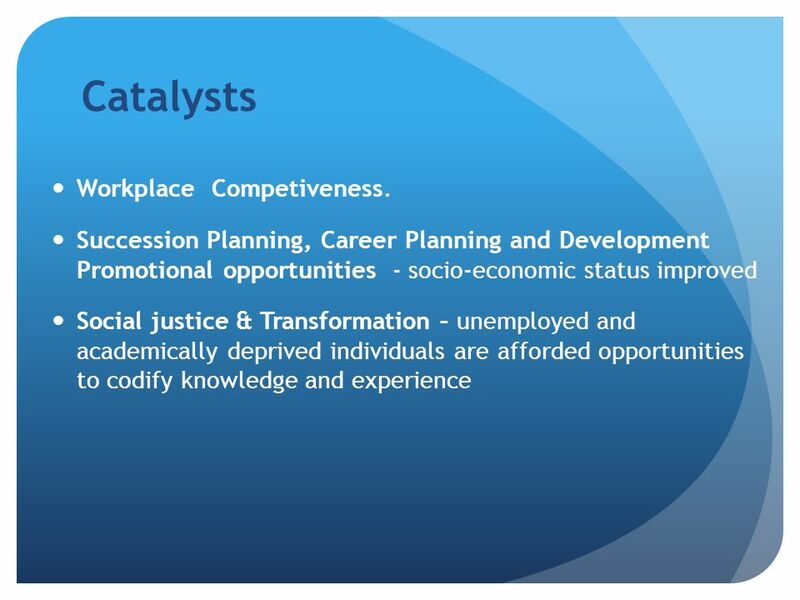 DEPARTMENT OF EMPLOYMENT, EDUCATION AND TRAINING Diversity, inclusion and participation. The QCTO Landscape Presented by Onicca Moloto. 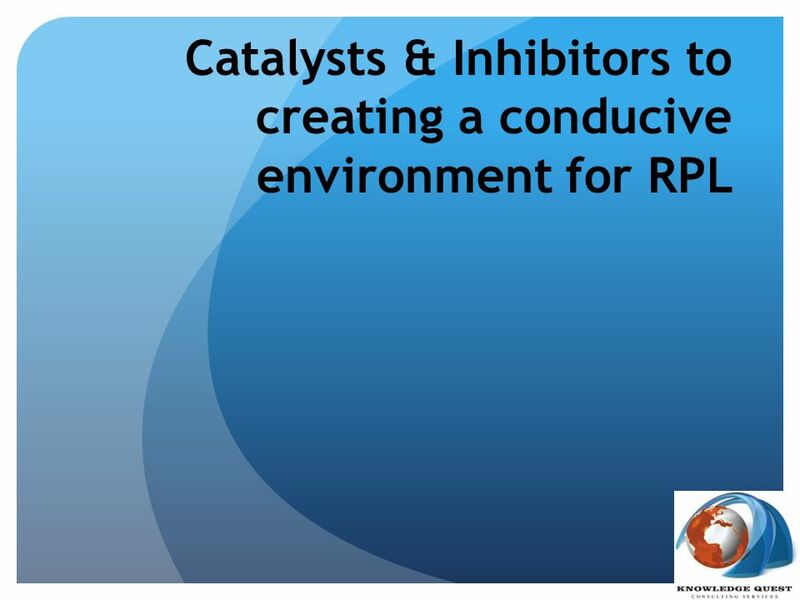 Presentation Outline  1. QCTO Mandate  2. QCTO Partnerships.  3. 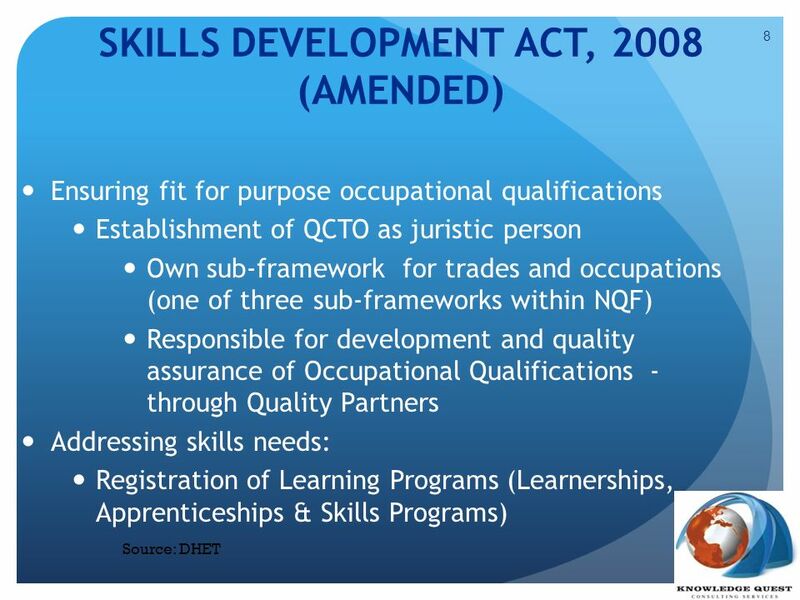 The New proposed NQF Landscape.  4. Determining CLIMASP Competencies Jerash University Development of Interdisciplinary Program on Climate Change and Sustainability Policy- CLIMASP Development. 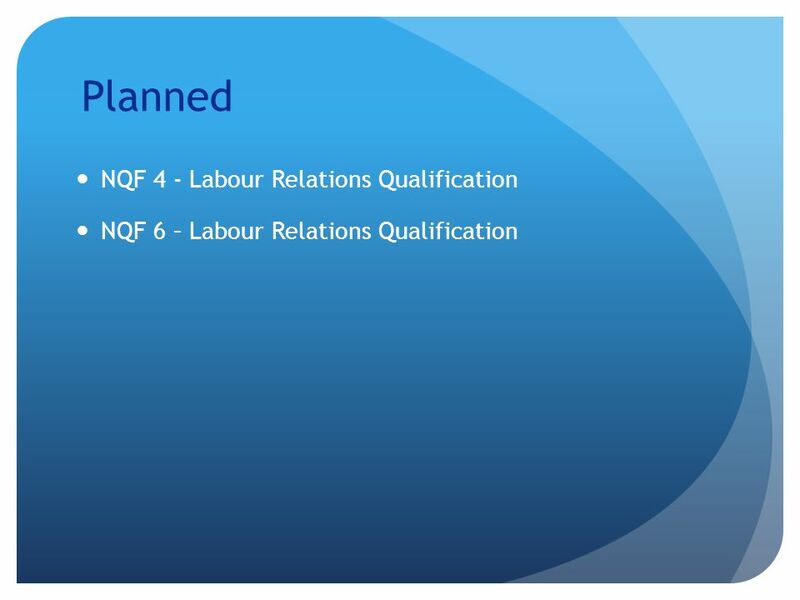 Organising Framework for Occupations. 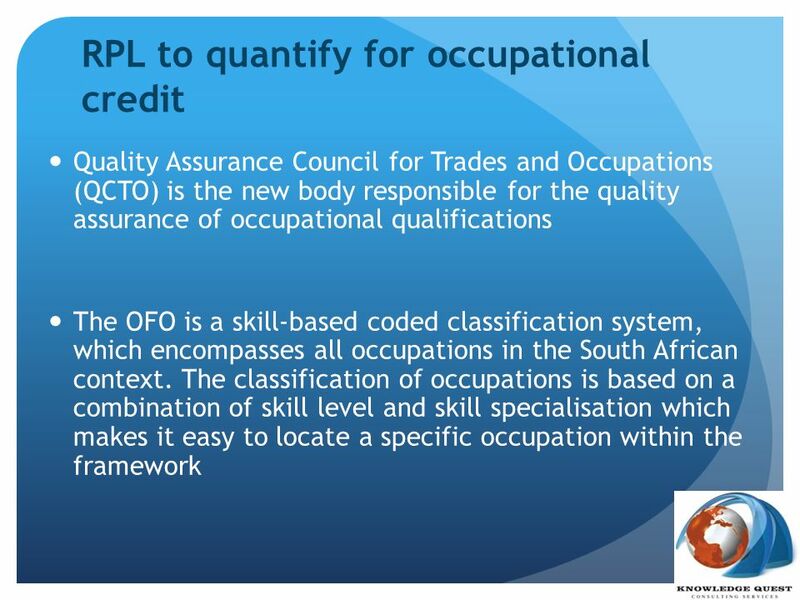 Background The South African Standard Classification of Occupations is currently based on International Standard. Project Scoping Meeting : Curriculum Development Process Project Scoping Meeting : Curriculum Development Process. Scoping Meeting Master Toolmaker (OFO Code ) 01 August 2013. 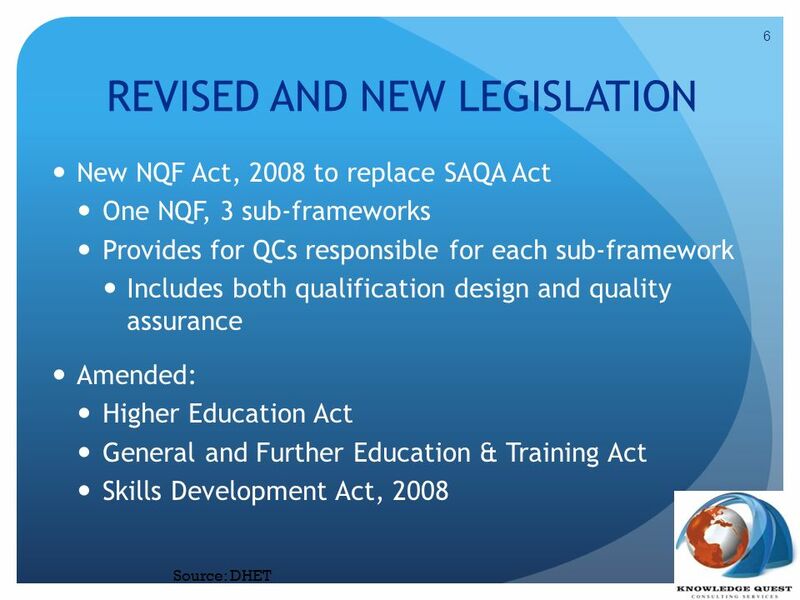 Quality Assurance and Professional Accreditation - national developments Bryan Maguire Higher Education & Training Awards Council “And never the twain. 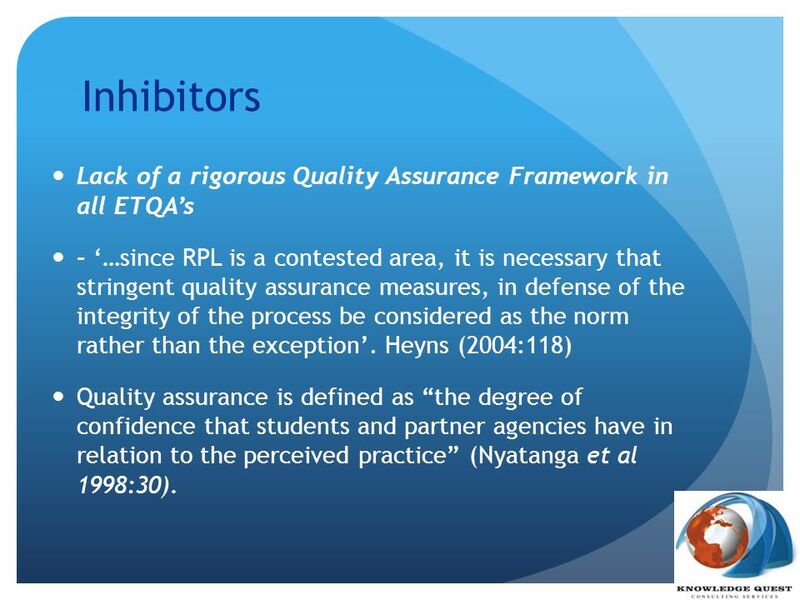 Towards management of the effective implementation of RPL Dr Heidi Bolton Senior Researcher SAQA 28 April 2010. Quality Assurance Moving from quality control to quality assurance of learning AgriSETA Conference “What is Quality Learning?” 25 October 2007. 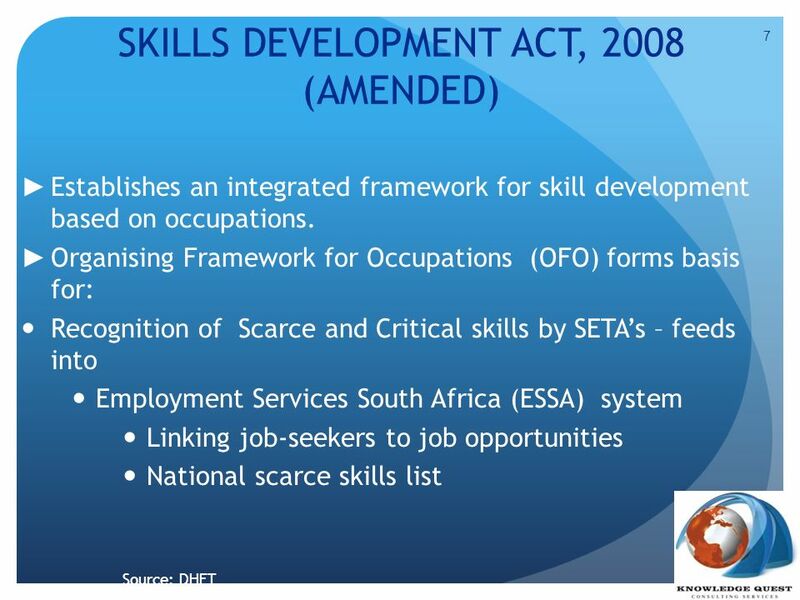 WHAT ARE SETA’S  SECTOR EDUCATION TRAINING AUTHORITIES  21 THAT COVER THE VARIOUS ECONOMIC SECTIONS  ESTABLISHED UNDER THE SKILLS DEVELOPMENT ACT OF. 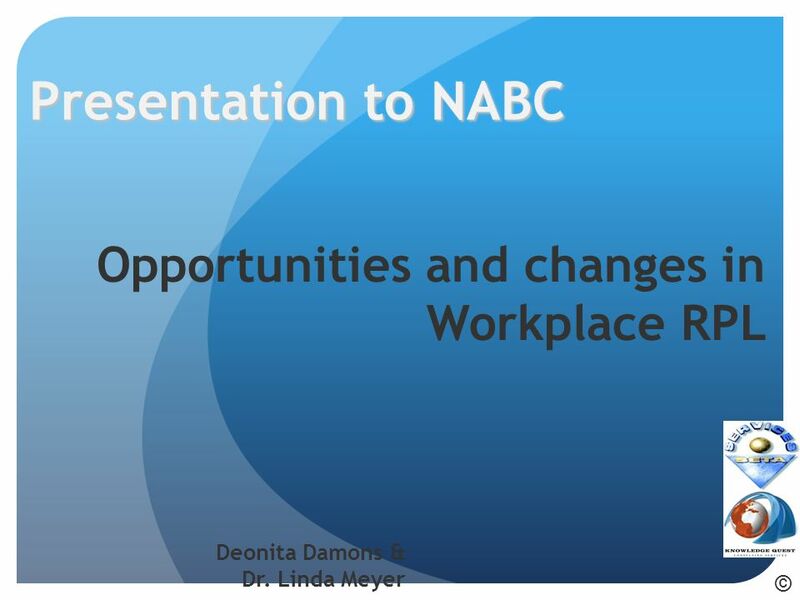 FORUM FOR PROFESSIONAL NURSE LEADERS 7 March 2014 CHANGES IN EDUCATION AND PRACTICE. 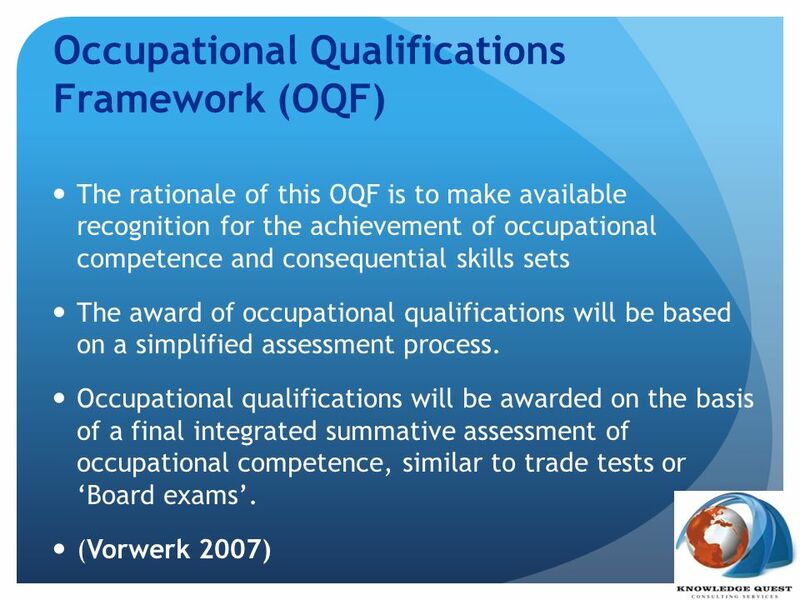 THE NEW QUALIFICATION FRAMEWORK.